Do you not only imagine the world of the future but feel driven to build it, too? Do you love to think of new ways to solve problems? Are you willing to experiment, revise and tinker for however long it takes to come up with the next great thing? Then, hello, Inventor. Imagine life without the Inventor: no Internet, cell phone, electric lights, buttons, sunscreen or movies on-demand. Without the inventor, there wouldn’t be airplanes, cars, or even wheels. No books, no medicine — quite possibly you would not even exist. All hail the Inventor! Inventors make stuff. They make stuff that solves problems and changes the way we do things. They make stuff to shift paradigms and sew ruffles into the fabric of civilization. They make stuff to entertain, save lives, explore outer space, and bring people closer together through communication. Inventors have strong powers of projection and can imagine their solutions to the world’s problems in full-scale dimension. Inventors experiment, risk and fail often. Most Inventors are in fact big fans of failure, seeing it only as information and answers that bring the inventor closer to a breakthrough. Inventors are passionate, intuitive risk-takers who are tolerant of uncertainty and who will forge ahead in faith with a relentless drive to realize their invention. There is nothing more frustrating to the Inventor than being ready to put it all together and not having the necessary tools, ingredients or materials to do so. Therefore the happy Inventor is well funded and stocked with plenty of time and everything necessary to make their vision real. Inventors need to bounce their ideas off of thinkers like the Nerd and Geek. Funding from the Prince and Princes is helpful, as is the social clout of the Class Leader. 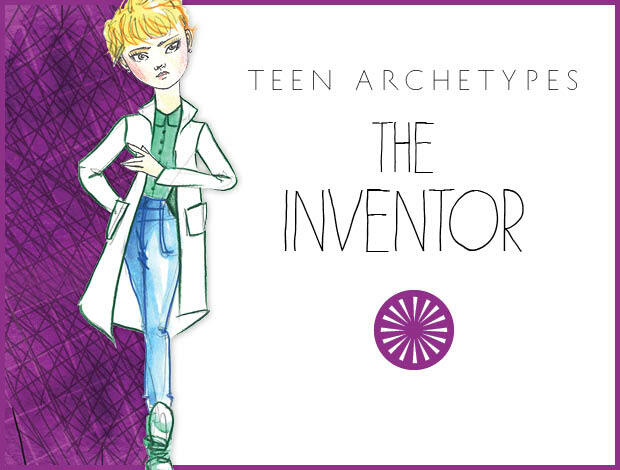 The Inventor is attractive for the playful and excitable energy he or she brings to life. Like others in the Visionary category, the Inventor is more satisfied than most with things that are not of this world… yet. It takes time and energy to bring non-reality into a state of being. Very special indeed is the partner who can stand by faithfully even when the Inventor is busy in his or her madcap scientific mode. Gifted in vision, intellect, mechanics, and creativity, the Inventor is challenged to put effort into things that really make a positive difference in the world for the long term and not to solve short-term problems by replacing them with long-term disasters. For instance, think of all the fossil fuel that is used in the shipment of bottled water to places that have freely flowing tap water of equal and sometimes higher quality. Then consider the number of landfills bursting with those empty plastic containers that are certain to break down in hundreds or thousands of years from now. Maybe it wasn’t such a great invention after all. If you’re an Inventor, use your powers for good. Turn the tides on the energy crisis, end world hunger, save the coral reefs. Deodorant-shaped butter? Vibrating pet massager? Motorized ice cream cone? Maybe it’s not the best use of your time.